Who doesn’t love Saint Patrick’s Day-the one holiday of the year that everyone who wants to be is a lucky Irishman! If you live here in Boston, it’s likely you’re looking forward to March 17th just like I am and you may even be getting ready to plan a get together with friends and family. This event has a long history of popularity within this city and is easily one of the biggest nights for celebration in the northeast region as well as Europe. If you are hoping to pack in some people for a fun and festive evening of Irish tradition, you may want to get a jump on finding just the right items for décor. You’ll need green streamers, a decadent spread of corn beef and cabbage and for the grand finale- a centerpiece worthy of even the feistiest of all leprechauns! 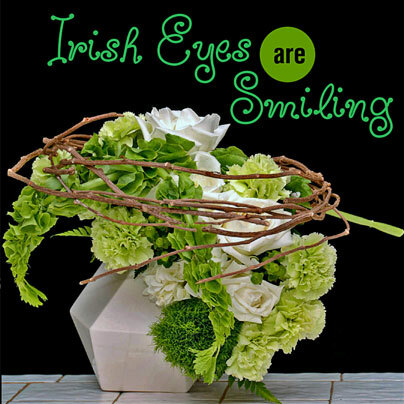 Yes, flowers are the perfect accessory to add when throwing a Saint Patty’s Day soiree and as luck would have it, florists have just what you’re looking for! Stocking inventory with authentic, cheerful and affordable blooms, designers are ready to whip up arrangements that will set the tone of your party precisely the way you want.